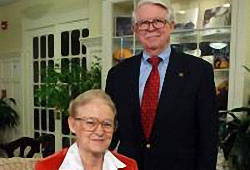 Walter '62 and Barbara Bass '61 know firsthand the power of scholarships to change lives. They credit the financial assistance they received from Elon with preparing them for successful careers. The couple decided to give back to their alma mater by establishing a charitable remainder trust with a gift of real estate. In the future, funds from the trust will be added to the Walter H. and Barbara D. Bass Scholarship, which assists Elon students with financial need and high academic achievement. "Elon was very good to us, and we felt like it was time to give back," Walter says. "Elon has blossomed, and we're proud to say we're Elon alumni." "We could not have attended Elon without scholarships, and we recognize the need to help others," adds Barbara. By funding a charitable remainder trust, the Basses will receive lifetime income as well as income and estate tax benefits. "This type of trust has made it very easy for us to give back," Barbara says. "It is convenient and has great tax advantages for us." The couple began making gifts to their alma mater in 1964. In addition to scholarships, they have been loyal supporters of Phoenix athletics and are members of the Phoenix Club, The Elon Society President's Circle and Order of the Oak, Elon's planned gift legacy society. The Basses fondly remember their Elon days. Both sang in the college choir and played in the band, with Barbara on saxophone and Walter on the trombone. To earn extra money, Walter worked in Elon's dining hall and chemistry lab, and he had a portion of his expenses paid by singing in the college's all-male quartet. Barbara worked answering calls to the college switchboard. Following graduation, Walter enjoyed a 34-year career as a biochemist with American Tobacco Co. in Richmond, Va., while Barbara taught math and computer science for 40 years. "There are still young people who are very capable who cannot afford to go to college," Barbara says. "If we can provide the opportunity for just a few of them to attend Elon, then I think we've done our job."